It was Sunday in a laidback city square in Jakarta. Two young civet cats in red vests chased each other while an adult on a leash sipped jasmine tea from a cup. They were soon joined by an agile civet in a Superman T-shirt and an otter in a pink hooded vest. The animals belong to members of Komunitas Musang Lovers Indonesia, a group of civet cat and otter lovers. The group has been meeting regularly to indulge in the new exotic pet craze that has hit Indonesia. About 10,000 civets are being kept as pets across the country, says the group. There were only about a dozen civet owners five years ago. "Owning dogs and cats is just too mainstream. Civets are unique and just as adorable. Some of us have also begun keeping otters," said coffee vendor Fajar Sidiq, 25, who owns a pair of male and female civets. Indonesia is known as a hotbed of exotic pet trade. People have been known to keep endangered animals such as slow lorises, eagles and pangolins, angering conservationists and animal rights activists. While it is not illegal to keep the more common species of civets as pets in Indonesia, activists say these nocturnal mammals should remain in the wild. They also fear that the hobby's rising popularity will only encourage poachers to capture them from the forests or breed them for sale. "When the trend dies, these animals will be abandoned. Why must wild animals be domesticated and then left to suffer just to feed a hobby?" animal rescue group Jakarta Animal Aid Network spokesman Benvika told The Straits Times. A baby Asian palm civet can be bought for around 250,000 rupiah (S$26), while the less common masked palm or small-toothed palm civet costs 10 times more. At wildlife markets where they are sold, they are often subjected to poor treatment, fed little and crammed in tiny cages, activists say. Mr Ernovian Ismail, 40, who owns six civets, said the Komunitas group discourages its members from adopting the rarer, protected species. But Ms Irma Hermawati, wildlife crime unit coordinator from US-based Wildlife Conservation Society's Indonesia programme, said: "Changing their natural behaviour is also abusing them. 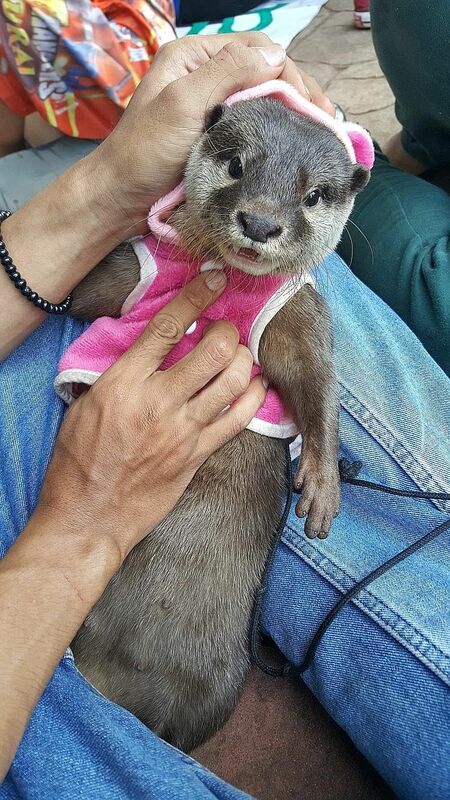 You don't have to own civets or otters to love them. Real love is to leave them alone."